Karna Das is a prominent Nepali singers living and performing today. 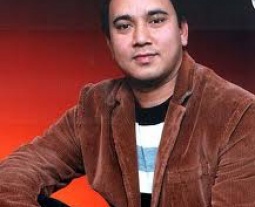 Das was born on 24 November 1974 in Pokhara. Das completed his high school education in 1993 and studied one year of Economics in college. He is a lead singer of Madhyanha band. He is married to Sima Das. He started his singing career in 1997 with the first song "Jindagi Ko Ke Bharosa." He plays piano too.